So the first part of this bed will be the vegetable arbor stretched over the the Kids’ Snack Garden with a tomato and a cucumber planted. Then we will have 2 of the cattle panel trellises we’ve used in the past. We are going to be growing 2 watermelons, a honeydew, and an Asian melon. Both of the watermelons are personal-sized, and the yellow fleshed one (‘Yellow Mini Tiger’) is seedless. 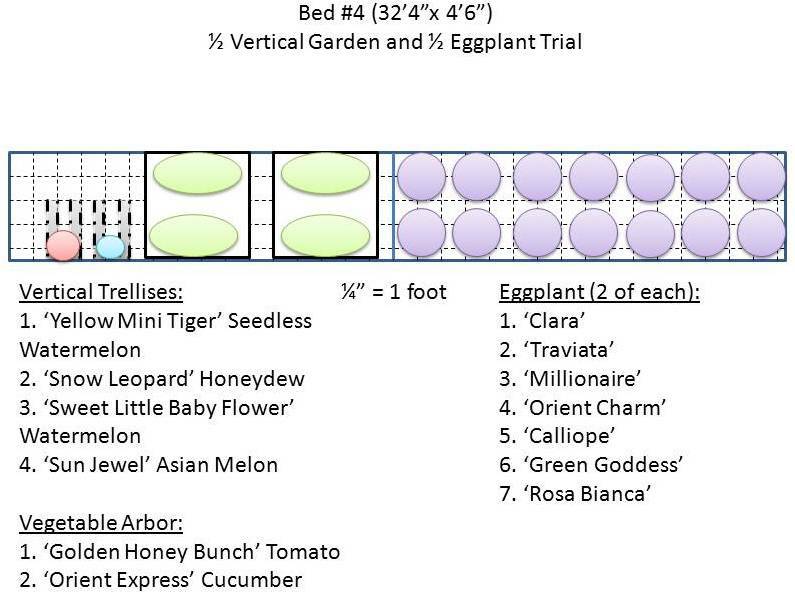 This will be something different for us, because to grow a seedless watermelon you need to plant the variety seeds and a pollinator seed. The seed packet will have 10 regular seeds and 1 pollinator. So we will have to make sure we have the right plants growing to get the melons! The other two melons are kind of interesting too. The ‘Snow Leopard’ honeydew has white and green streaked skin and a white interior. The Asian melon is an interesting variety as well. I don’t quite know how to describe it…the fruit is oblong with yellow and white stripes. The flesh white and fairly delicately flavored. Then there’s all that eggplant. Yum. Err…not so much. (If you’ve ever been to one of my classes on eggplant you know that I find it to be a beautiful plant, just not very tasty. And breading and frying it doesn’t count.) Since we are going to have so many varieties this year, we almost have to try a number of recipes just to see if I can find some way to fix eggplant that is tolerable to eat. Anyway, varieties! ‘Clara’ is a white, Italian type (traditional size and shape) and ‘Traviata’ is a dark purple/black Italian type. ‘Millionaire,’ ‘Orient Charm,’ and ‘Green Goddess’ are all long, skinny, Japanese types. ‘Millionaire’ is dark purple, ‘Orient Charm’ is lavender, and ‘Green Goddess’ is, well, green. ‘Calliope’ is purple and white striped, and it is smaller. It can be harvested for “baby” eggplant (2″ x 1.5″) or mature size (3-4″ x 2.5″). ‘Rosa Bianca’ is an Italian heirloom that is white with a pink-lavender blush. It is a little more round and ruffled in shape. Posted on February 5, 2013, in Garden Planning and tagged eggplant, garden planning, garden plans, melon, vertical garden, watermelon. Bookmark the permalink. Leave a comment.